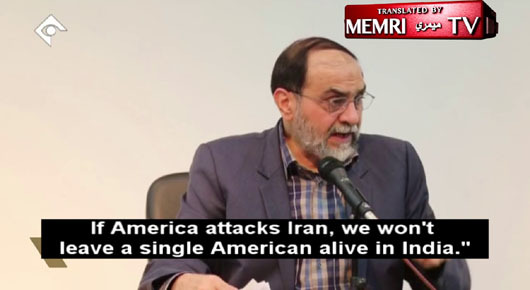 Iran boasts it has willing-to-die supporters worldwide, including in U.S.
Iran has “supporters inside America and Europe” who “are willing to sacrifice their lives” for the Islamic Republic, a member of Iran’s Supreme Council for Cultural Revolution said last month. In an interview with state-run Channel 1 TV on Dec. 21, which was translated by the Middle East Media Research Institute (MEMRI), Hassan Rahimpour Azghadi said that Iran’s global influence extends into “Yemen, Lebanon, Palestine, Afghanistan, Pakistan, India, and other countries throughout the world,” including in the U.S. and Europe. “The Islamic Republic’s global influence is so powerful that it extends to Yemen, Lebanon, Palestine, Afghanistan, Pakistan, and many other places. [Iran] has forces that are willing to sacrifice their lives. Iran does not even have to give them instructions.